We’d love your help. Let us know what’s wrong with this preview of Thomas Cranmer by Colin Hamer. To ask other readers questions about Thomas Cranmer, please sign up. 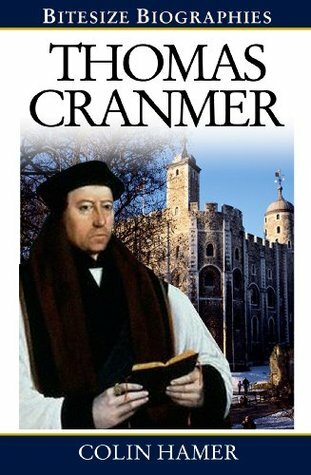 This brief biography of Dr. Cranmer is an excellent (though imperfect) overview of the some of the significant events and issues of his life. I highly recommend this text for anyone interested in the life of the great English Reformer. While visiting my son’s apartment, I spent the afternoon reading this small book which is in a series on church history. Having been in England many times and being interested in its history, especially from Henry VIII forward, I found this book fascinating. Thomas Cranmer (1489-1556) was an evangelical force behind Henry VIII’s departure from the Roman Catholic Church and establishing of the Church of England with the King as Supreme Head. Cranmer served as Archbishop of Canterbury during the r While visiting my son’s apartment, I spent the afternoon reading this small book which is in a series on church history. Having been in England many times and being interested in its history, especially from Henry VIII forward, I found this book fascinating. Thomas Cranmer (1489-1556) was an evangelical force behind Henry VIII’s departure from the Roman Catholic Church and establishing of the Church of England with the King as Supreme Head. Cranmer served as Archbishop of Canterbury during the reigns of Henry, his son Edward, Mary Tudor, or “bloody Mary,” under whose rule he was executed. Cranmer supported Henry’s annulment of marriage to Catherine of Aragon so he could marry Anne Boleyn, the first and second of the six wives of Henry VIII. This was against Catholic marriage law and caused Henry, with Cranmer’s support, to declare the Church of England a separate, mostly Protestant Church with the King as Head. A basically a friendly biography of Thomas Cranmer and not entirely undeserved. Cranmer was set into a turbulent and rocky time and he acquitted himself well. Living within the politics, both church and state he often compromised out of necessity. He saw the end game as more important than the individual battles. May we do as well in our turbulent and rocky times. Excellent, very readable and honest account of the life of Thomas Cranmer over the changing times of Henry VIII, Edward VI and Mary. It shows his important, and maybe not well understood, contribution to the Church of England during the Reformation as one who accepted the Bible as the final authority. A concise biography of Thomas Cranmer, the person at the center of the English Reformation. A really good overview of English politics in church and state covering Henry VIII, Edward VI, and Mary. A quick read without too much detail to give an overview of the period.